Intercropping and cover cropping are practices that increase diversity in the cropping system and enhance the utilization of resources such as light, heat and water. These practices can also help to suppress weeds and increase the likelihood of being able to reduce herbicide use in the cropping system. Alternatively, in organic or other systems where herbicides are not used, intercropping and cover cropping can reduce the yield loss potential and provide stability in the system. Intercropping involves growing more than one crop in the same field at the same time. The crops may be seeded at the same time (mixed intercropping) or they may be seeded at different times (relay intercropping). Strip intercropping is a production system where different crops are grown in wide strips (usually the width of a seeder) in the same field. Two or more crops grown together with the goal of maximizing total yield from all intercrop components. Yield of each intercrop component is probably less than when it is grown as a sole crop, but the total yield is more than the sum of intercrop components grown separately (i.e. LER greater than 1). One main crop with one or more secondary crops interseeded for weed suppression, erosion control, nitrogen fixation, etc., with the goal of maximizing yield of the main crop. Many cover cropping systems would fall into this category as well (sometimes called smother crops). Intercropping can provide a number of benefits to a cropping system including stability, overyielding, and reduced chemical use (both fertilizers and pesticides). Research and experience from around the world have shown that intercropping and cover cropping systems tend to suppress weeds better than sole cropping systems (Liebman and Dyck, 1993). This is especially true with cover crops or “smother” crops such as forage legumes interseeded with a main crop such as a cereal. 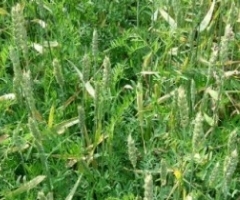 Intercropping grain crops can also be useful for suppressing weeds, especially when the desired crop is a poor competitor. Liebman, M. and E. Dyck. 1993. Crop rotation and intercropping strategies for weed management. Ecological App. 3: 92-122.